An important new book by a recognized medical research expert describes Big Pharma as akin to the Mafia. In an interview conducted by our colleagues at ANH-Europe, Dr. Peter C. Gøtzsche exposes the flaws of the drug approval system, our reliance on dangerous drugs, and the deadly co-dependence between regulators and industry. Dr. Gøtzsche is co-founder of the highly respected Cochrane Collaboration and Cochrane Reviews, a leading journal of evidence-based medicine. The interview is particularly timely now that the FDA has decided to remove restrictions on the dangerous drug Avandia. 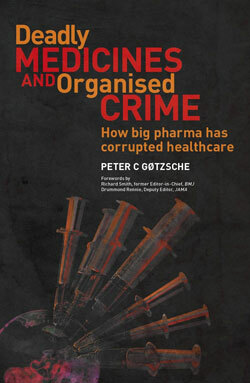 Dr. Gøtzsche’s new book, Deadly Medicines and Organised Crime: How Big Pharma Has Corrupted Healthcare, points out that the pharmaceutical industry is allowed to test their own drugs, and thus effectively be their own judge. He calls this a threat to safe medicine and asks for open access to all research data, including raw data, because otherwise, data can be easily suppressed and conclusions manipulated by industry. The book also questions the effectiveness of some very common classes of drugs such as cough medicines and anticholinergic drugs (used to block involuntary movements of muscles and to treat diseases like asthma, incontinence, gastrointestinal cramps, and muscular spasms), and points out that even if some drugs are slightly effective, their dangers far outweigh their benefits. Gøtzsche discusses our over-dependence on drugs when there are many non-pharmaceutical approaches available, such as diet, lifestyle changes, and exercise (as ANH has long been advocating). Here in the US, the problem is compounded by the FDA’s reliance on industry for funding via user fees, which compromises the agency’s independence in decision-making. Drugs may be approved even if they are inferior to previous approved drugs—only about 15% of new drugs provide an important therapeutic gain. Moreover, many drug companies only spend 1.6% of their revenue on discovering new molecules for drugs (while spending over 46% on promotion), so it’s not surprising that new drugs are only slight variations of the old ones. In addition, the government channels a great deal of taxpayer money to groups that support drug company interests in the media. For example, the government gave WebMD a $4.8 million contract to educate doctors about the Affordable Care Act. While WebMD touts its independence, the site is financially dependent on pharmaceutical companies. In 2010, WebMD created a depression screening test for website visitors in which 100 percent of quiz-takers ended up having a “high likelihood of major depression,” and were asked to discuss available drug treatment. In other words, WebMD was apparently a willing participant in getting people who were seeking health information to take SSRI prescription drugs, sales of which are estimated to hit $1 trillion next year, and as high as $1.2 trillion in 2017. New drugs created by Big Pharma are routinely tested against so-called placebos rather than against established effective treatments. More to the point, allowing companies to test their own products is the very definition of bias. Drug companies are even allowed to exclude patients most likely to have adverse events, so the problems don’t even show up in the research. Most drug representatives do not discuss a drug’s documented adverse events with physicians. As an example of the brokenness of the system, the FDA has decided to remove restrictions on prescribing and using the diabetes drug Avandia—despite the fact that the FDA’s own staff had expressed serious concerns about the drug in the past. Not surprisingly, it was Glaxo's top selling drug before it was removed from the market. Be sure to read ANH Europe’s interview with Dr. Gøtzsche. It’s a powerful exposé of a system that is killing, not healing us.